The CTS New Weekday Missal is a brand-new edition with the new English translation of the Mass (2011) and everything you need at Mass, all beautifully presented. Order of Mass with Eucharistic prayers, prefaces, concluding rites and blessings. Full Calendar; Lists of Feasts and readings for reference. Parallel Latin texts alongside the English for the Order of Mass and the priest's prayers. Preparatory prayers for before Mass. Prayers of thanksgiving and devotion for after Mass. Comprehensive appendix of prayers and devotions such as Stations of the Cross, prayers before the Blessed Sacrament. Inspiring introductions for major feasts and seasons. Ribbon placeholders (in different colours). CTS New Daily Missal by Catholic Truth Society was published by Catholic Truth Society in February 2012 and is our 8284th best seller. The ISBN for CTS New Daily Missal is 9781860827402. 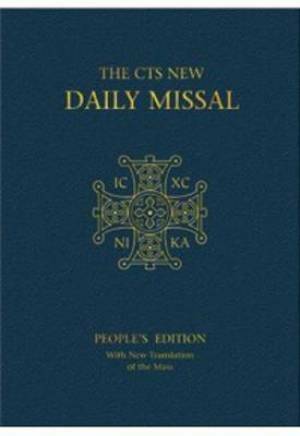 Be the first to review CTS New Daily Missal! Take a peek at some articles related to CTS New Daily Missal. Got a question? No problem! Just click here to ask us about CTS New Daily Missal. A:You are correct. The Missal's height is actually 178mm Thank you for using the Q&A Forum.